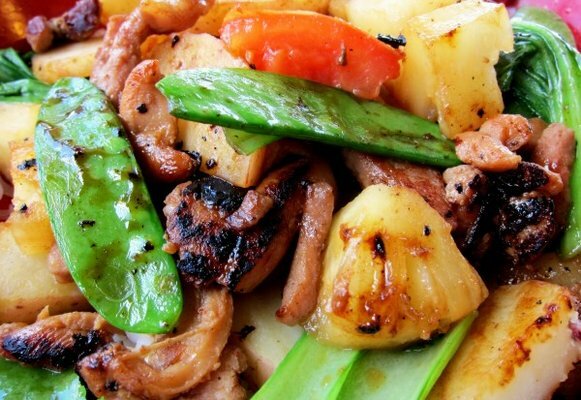 Kahunas Mongolian BBQ is where you are able to create your own stir-fry by choosing your ingredients and sauces. Interact with our grill warriors as they prepare your meal right in front of you on our 48 inch round Mongolian Grill. Kahunas has something for everyone, from vegetarians to meat lovers and even gluten free diets and we didn’t forget about the kids they will enjoy Kahunas also. At dinner you will be able to enjoy lamb, shrimp, mussels, beef chuck, chicken, pork loin, and bacon, (and scallops can be added for an additional cost) plus all the fresh vegetables and amazing buckwheat noodles!! At lunch meats are: Beef, Chicken, Bacon, Pork but the seafood can be added for an additional cost even at lunch, ask your server for details. Choice of white or brown rice.